It Must be Crinum Time Again! 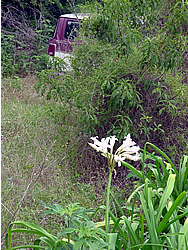 The building can fall or old vehicles can rust but the Crinum will survive and thrive! This milk-and-wine Crinum is thriving in an abandoned site in Atascosa County. The saying: "When it rains, it pours!" can definitely be applied to the subject matter of questions received by PLANTanswers.com This has been the case with questions about Crinum lilies for several months now. It started with Sherry in Charlotte, North Carolina, wanting to know if Crinum lilies can be grown in Charlotte which is in growing zone 7. I thought I had solved the problem but then Melissa from Bloomington, Illinois, writes to see if Crinums will they grow in zone 5a? Melissa writes: "My guess is the answer to the question of Crinums growing in zone 5a is no but it never hurts to ask. I live in 5a and on a creek. I am looking for a hardy variety flower for the hillside next to the creek. I saw an article on Crinums and was intrigued. Bulbispernum sounds nice ffor the purpose but I suspect it will be too cold. I may have to reserve my Crinum curiosity to a nice gift for my mother-in-law in Tampa." I had "dodged another Crinum "bullet" but the barrage was not over---- Mary Anne of Mesa, Arizona writes: "Can the Crinum Lily be grown in the heat of full sun in Mesa, Arizona, through temperatures of between 100 and 115 degrees F. for weeks at a time? Marilyn in Dallas, Texas, writes: "Would Crinums do good in Dallas? If so would all of them or would I need a special kind? Then, Anne in Wichita, Kansas, writes: I just ran across this beautiful and hardy bulb on the Internet. I live in zone 6 and want to know if they would be hardy in my zone. If one species would be better than another in my area, could you recommend it?" Then, Diane in Connecticut writes: "Can I grow these here in CT or are they just for the South?" Traipse through any old Texas cemetery or yard and you are almost assured of running across one of the most enduring and cherished of southern bulbs, the Crinum lily. Though they somewhat resemble them, Crinums aren't actually lilies or even related to them. Like oxblood "lilies", Aztec "lilies", St. Joseph's "lilies", rain "lilies", and spider "lilies", they are in the amaryllis family instead. The amaryllis family is well known for a bunch of tough hombres in Texas. The genus Crinum includes about 130 species occurring in warm tropical regions of the world, especially Africa and Asia. This genetic heritage makes widespread cultivation only possible in zones 7-10, as they aren't cold hardy in northern climates. This also makes them supremely adapted to hot, muggy southern conditions. Crinums (pronounced "CRY-nums") are to the South what peonies are to the north, big bold perennials with wonderful flowers for cutting. The often fragrant, lily-like flowers occur in clusters on stalks around three feet tall and can be white, pink, or striped (milk and wine lilies). Crinums have big bold foliage that often cascades to the ground in lush mounds. Haughty gardeners often unduly complain about the mounds of rotund leaves. If you ask me, it's like complaining about how big your momma is. With all that Crinums and mommas have done, we should learn to shut our mouths! Crinums are what they are and they don't really care whether you like their foliage or not. They're a lot like Texas*big and brash, take it or leave it. If their foliage gets marred by insects, it is acceptable to occasionally cut it all off so that it may be replaced with new healthy foliage. It's also a good time to toss a bit of fertilizer around them. This "crew cutting" is a rare acceptance for bulbs so don't over practice it if the foliage is generally healthy. Although Crinums are extremely drought tolerant and forgiving, they perform best with full sun and regular moisture. They are unique in that most of them hail from parts of the globe that are lakes part of they year and deserts others. This gives them the unique ability to handle just about anything Texas weather can dish out. I believe it was my mentor, William C. Welch, who stated "No Crinum has ever died", and he may just be right. If you happen to kill one, I certainly wouldn't advertise it. Crinums produce huge water and food storing bulbs below the ground, which makes digging old clumps a major chore. The good news is that they never need dividing unless you want to propagate more. If so, trench around the entire clump, severing all the roots, with a sturdy sharp shooter before trying to pry it from the ground. Once out of the soil, use a hose and nozzle to remove the water from the roots before dividing the individual bulbs. Some Crinums multiply quickly and others hardly at all. You can tell how many bulbs there will be by the number of necks protruding from the ground. As Crinums have year round roots it is best to replant them immediately and not let them dry out. It generally takes them about a year to settle back in. To be quite honest, I've never met a Crinum I didn't like. They range in size from small to large, with foliage from upright to cascading. Flowers can be trumpet or spider-like and can smell like vanilla or perfume. Dr. Welch likes the more subdued colors while I've always lusted after the gaudily striped milk and wine types. As you may know, I like my flowers a little on the trashy side. Here are a just a few of the many wonderful Crinums to consider for your Texas garden. 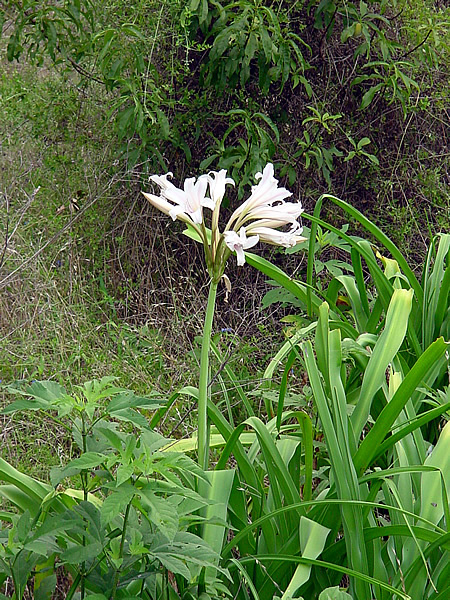 Crinum bulbispermum: This native of South Africa is often found naturalized in Central Texas ditches. It has gray green foliage in fountain-like mounds and trumpet type flowers, ranging from white to pink and striped. It isn't the prettiest Crinum, but it is the earliest blooming, toughest, and most cold hardy. It is the parent of most of the good garden hybrids. Crinum x digweedii 'Royal White': This old fashioned favorite has somewhat spidery white blooms with pale pink stripes. It is one of the last to bloom, generally late summer and fall. It also goes by the name of "Nassau lily". My Granny Ruth had this one in her yard. Crinum x herbertii (milk and wine lilies): Many old fashioned hybrids are included here with fragrant, white, trumpet type flowers striped with some relation of red, pink, or purple. My Grandmother Emanis had these next to the front porch, near the swing. The dark, wide striped, 'Carol Abbott' is one of many fine selections. Crinum x powellii 'Album': This cold hardy selection with pure white flowers is often available (along with her pink sister) through summer Dutch bulb catalogs. It provides beautiful cut flowers for church services, funerals, or weddings. Crinum x 'Bradley': This cultivar from Australia has beautiful tall flower spikes topped with dark pink flowers above lush green foliage. Crinum x Ellen Bosanquet: Although the flowers are actually dark pink, this is often referred to as a "red" flowered Crinum. It's quite common all over the South and may actually prefer a touch of shade during the heat of summer. My Grandmother Emanis liked this one best. Crinum x 'Mrs. James Hendry': This Florida introduction by the late, great, southern horticulturist, Henry Nehrling, produces wonderfully fragrant white flowers flushed with pastel pink in mid summer. Dr. Welch is in love with this gal! Don' t tell Diane. My mailbox sometimes seems to be more of a trash receptacle than a mailbox. For every item I request, there are always three times as many junk fliers and catalogs, particularly the bulb catalogs. I'm always amazed at the variety of tulips, narcissus, hyacinths and other Dutch-grown bulbs and how affordable they are. In most cases these bulbs require consistently cool conditions and fertile soil to perform as advertised. With few exceptions one must consider them as annuals (at best). Our wildly variable weather usually disrupts their cultural needs, and heavy soils and summer's heat stunts or kills most outright. Tulipa clusiana. Sometimes listed as "Cynthia" or "Candy Tulip." Delicate red and creamy white (sometimes yellow) petals, to about ten inches in height. Requires good drainage, otherwise carefree. Muscari neglectum. "Grape hyacinth." Diminutive, chive-like foliage with inky blue spikes six to eight inches high. Form mat-like colonies. Leucojum aestivum. "Snowflakes." One of the hardiest of spring bulbs. White, drooping, bell-shaped clusters of flowers. Foliage is lush during cool weather, fading in late spring. Oxalis crassipes. "Wood Sorrel." Another early bloomer, these form tidy mounds with shamrock-like foliage. Brilliant pink clusters sometimes entirely cover the foliage. Often repeats in the fall. Lycoris radiate. "Guernsey Lily." Although the common name leads to some confusion, the red fall "spider" lily is well-known throughout the South. The local strain of Lycoris produces 12 - 13" stems topped with delicate red, spidery flowers before sending up dark green strap-like leaves. Readily naturalizes. Rhodophiala bifida. "Oxblood Lily." A South American import that has similar growth habits as Lycoris. Deep red, two to four flowers emerge in late August and September. Older paintings may carpet whole lots and abandoned homesteads. Foliage growth follows blooming and ceases as spring arrives. Zephyranthes and Habranthus. These summer growing bulbs are collectively known as "Rain Lilies." Native species include the "Prairie Lily" (Zephyranthes drummondii) and the smaller Z. chlorosolen. Both are white flowered. The prairie lily blooms early (March - June) and considerably larger, up to one foot tall. The smaller species tends to spread quickly from seed and can infest lawns. With some cold protection, Z. grandiflora produces vibrant pink flowers that blend well in borders with companions like Monkey grass or Liriope. Habranthus is a related genus that includes our local "Copper Lilies" (H. tubispathus v. texensis). After a good rain in late August, you'll find "coppers " in scattered locations throughout Central Texas, but you'll have to look closely as they tend to blend in with drought-cured grasses. Iris albicans. Several color forms. Iris germanica. "German Bearded iris." Spuria irises. Various hybrids in a wide range of colors. With a little more attention (primarily additional watering), the Louisiana Irises offer an astonishing menu of colors and sizes. Additional breeding ventures are providing new plants yearly. Bletella striata. "Ground Orchid." Yes, this is a true orchid, best planted as an under story subject as summer sun will scald its handsome, pleated foliage. Overhead shade will also protect its early purple blooms (as early as February). Also, comes in white that is, perhaps, slightly less vigorous. Polianthes tuberose. "Tuberose." With good drainage and ample mulching, these Mexican exotics are quite rewarding in the middle border or in mass. Sun-loving, they are certainly prized for their tall sprays of pearly white, tubular flowers. Tuberose fragrance is a powerful combination of spicy-sweetness. Sprekelia formosissima. "Aztec Lily." From a cluster of unremarkable, lime green leaves, the flower spike of this amaryllis kin is intriguing. When it opens, the sheen and crimson brilliance are startling. Sprekelia need ample sun and good drainage, making them good choices for features such as rock gardens. Narcissus. "Daffodils." One of the oldest groups of cultivated bulbs and one that dominates many catalogs. Yellows and whites are the main theme with some oranges and pinks thrown in. Good drainage without withholding moisture is essential to growing a Narcissus. Another key is selecting strains that bloom early, as "bud blast' is common on suddenly warm days. Allowing the post-flowering foliage to dry is important to ensure flowering next year. N. jonquilla x odorus "Campernelle"
Liliums. "True Lilies." The genus Lilium includes eighty to ninety different plants. However only very few are fool-proof in our gardens. The plant we regard as the "Easter Lily" is the fragrant Lilium longiflorum. Although slightly tender for Central Texas, areas closer to the coast or points south may offer enough cold protection for this lily. In cooler areas the "Easter Lily" of choice is L. candidum or the "Madonna Lily." These plants require some degree of lime and little else. In April or early May they exhibit several porcelain white, fragrant blossoms about two feet above tidy tufts of foliage. By far the easiest of lilies for our area are the Aurelian hybrids. Overhead shade is essential for Aurelians as our intense sun will bleach or burn the tops. Most reach considerable heights (up to 7 feet!) and may need staking support. Many colors are available but our heat tends to diminish color intensity on most. "Glorious Lily," another member of the Liliaceae worth of garden space acts more like a vine. Gloriosa lily (Gloriosa rothschidiana) is easily accommodated in average soil but suffers in the hottest sites. Tubers should be planted near a supporting device (post, tree, etc.) to allow the vine's tendrils to climb to blooming height of 4 - 6 feet. The flowers are spectacular, downward-facing red and yellow "comets" with outward flaring stamens. The effect is like an exploding star. Ample mulching ensures against freeze damage. Hippeastrum. "Amaryllis," Amaryllis are another prominent feature of Dutch offerings. With few exceptions, modern hybrids were bred for flower size only. Cold hardiness and disease resistance qualities were mostly ignored. Consequently, few make the grade as garden worthy for our area. The "Red Easter Lily" of Central Texas is A. x johnsonii , an early hybrid introduced in our area with the first wave of settlement. Their glossy bronze, early foliage produces two foot scapes topped with four to six scarlet trumpets with white-starred throats. Blooming period in our area is usually mid-April. Amaryllis aulicum, a little known species from Brazil, is generally regarded as a pot plant due to its December flowering habit. However, hybrids of this robust plant can be choice garden subjects because of its resistance to mosaic virus, the bane of all amaryllids. One newer hybrid of note is the summer flowering A. x "San Antonio Rose." A tidy growing plant of superior vigor, "the Rose" forms tight colonies of smallish bulbs with dark green, reddish edge foliage. Twin flowers are flaring with ruffled, rose-red petals accented by greenish-yellow throat. As with any newer entry, cold-hardiness is unknown but with some sheltering, this plant offers some promise. Similar potential is exhibited by a related species A. papilio , the "Butterfly Amaryllis." The compressed, wing-like petals of this species combine the striking play of rich brownish-maroon against the chartreuse background. All Amaryllis need good drainage, yearly soil enrichment and partial protection from afternoon sun and cold winds. Hymenocallis. "Spider Lilies." These bulbs lend a very tropical look to beds and pots with lush, strap-shaped foliage and delicate white petals. Several species are native to the United States but are scarce in trade sources. One of the showiest spider lilies is one lacking a true botanical name. It is best known as Hymenocallis "Tropical Giant" and is found throughout the Deep South. Established plantings will form luxurious mounds of lime green, three foot tall leaves bearing scapes of fragrant flowers in early summer. This plant is most content when set with manure and well watered. In areas north of Austin, winter mulching will benefit this plant. Crinum. "Cemetery Lilies." This group is the trademark planting of old settlements throughout the South. Although sometimes referred to as "swamp lilies." Most require only moderate amounts of moisture to thrive. Many relish our heavy soils and are indifferent to high soil alkalinity. With mulch and Southern exposure, most are reasonably hardy into Zone 7. One type is referred to as "Milk and Wine" lilies as their creamy petals exhibit varying pink to rose striped keels. Most are hybrids of questionable pedigrees but garden worthy nonetheless. Established plantings may reach 3 feet in height and form colonies 4 feet or more across. Like most Crinums, these are most bloom-responsive after spring and summer rains. Frequently, one notes large clumps of strap-like foliage as foundation plantings or in old graveyards. These are the most common Crinum in our region. Powell's lily (Crinum x powellii) is a robust hybrid from the late 1800's. A choice white form is also available, but most are fleshy pink. Many southern road swales are home to the South African species, C. Bulbispermum. Most are pink flowered but can vary from white to near red. All have characteristic grayish to blue-green, arching foliage. One form that blooms relatively early is "Sacramento." "Alamo Village" Old "found" variety, dwarfish with pale lavender blossoms. Spicy fragrance. "Bradley." Moderate sized with dark green, narrow foliage. Fluorescent, dark pink flowers with white "eye zone." "Ellen Bosanquet." Broad, lush crepey foliage to 4 feet. Dark, wine red flowers. "Jubilee" Newer hybrid, mauve petals with a delicious scent. Reblooms readily. "Mrs. James Hendry." Compact with dark green, channeled leaves. Spicy scented white petals with lavender overtones. "Stars and Stripes". Popular, striped clumping variety. "Summer Noctourne". Tidy plant sporting flared, lavender-flushed white flowers. Easily grown. "Walter Flory." Uncommon bi-colored, wine on light pink with green tips. Always keep in mind the cemetery lilies are generally very long-lived and difficult to dig after establishing, so initial placement may require some careful thought. As once can see, there are many hardy bulbs that can be grown in Central Texas. Some can be found in those Dutch catalogs, while many more can be found in old neighborhoods and from local specialists. . . like the lady down the road with the "Yard Eggs For Sale" sign. Summer Bulbs: Grow and bloom during the summer and go dormant during the winter due to cold temperatures. Most are tropical in origin. They respond well to irrigation and fertilizer. Annual bulb: A bulbous plant that is only useful for one season (doesn't reliably return and bloom each year). Examples: tulips, Dutch hyacinths, and caladiums. Short lived bulb: A bulbous plant that only performs well for a few years and gradually declines. Examples: large flowered daffodils, most true lilies, and most gladiolus. Spring bulb: Bulbs that bloom in late winter or early spring. Mos t of these grow foliage during the winter and spring and go dormant in the summer. Examples: jonquils, snowflakes, and narcissus. Summer bulb: Bulbs that grow and bloom during the late spring and summer. Most are tropical in origin, go dormant during the winter, and are somewhat tender and grown primarily outdoors only in the South. Examples: Crinums, hymenocallis, and cannas. Fall bulbs: Bulbs that bloom in late summer and fall after a summer drought induced dormancy. They normally bloom without foliage and grow foliage during the fall and winter. Examples: spider lily (Lycoris), oxblood lily, and rain lilies. Naturalize: When bulbs multiply and spread on their own and seemingly grow "wild". Perennialize: When bulbs return each year as perennials but may or may not naturalize. Characteristics of bulbs: Easy, low maintenance, drought tolerant, light feeders, more expensive, long lived, mostly propagated by division. Soil requirements: Not particular. Good drainage is best for most. Annual types require "annual soil mix."